Extreme Southeast Colorado - I have to admit. We entered my favorite part of the season as far as the travel route goes. We are here on the High Plains. It's not that I don't like the other places we go. That's far from it. Each place has something unique and special to offer. It's just that this is HOME. The later part of my growing-up years happened here, as did some of my adult life. Ryan still has to hear about how he took me away from southwest Kansas when we got married, which I'm sure he really appreciates. My heart will always be where my family is, but the High Plains will always have a piece of my heart. In fact, I may be willing to move my heart back if anyone is willing to donate a nice little farmstead to my cause. Dodge City, Kansas - A little over a week ago, I received a Facebook message request. I hit "accept" to get a look at what this perfect stranger had to say. In the message, this gal explained to me that her and her husband both grew up on farms in Oklahoma, but they had made their home in the Philippines for thirty-five years now. She continued on to say her husband never missed a High Plains Journal issue and that he particularly loved the All Aboard Wheat Harvest program. How cool is it that? This program is so widely renowned. We chitchatted about how harvest was going, and she then mentioned to me that there was one particular photo that her husband loved. The only thing was this; he had only seen it in black and white, and he had always wanted to see it in color. I asked her to send me a "photo of the photo," and I would see what I could do in terms of hunting it down in my picture archives. Dodge City, Kansas - There are two cup holders in the combine. I jumped in for a few rounds and put my lemonade-flavored Monster Rehab next to John's filled-to-the-brim Yeti coffee cup. Combining along, I hit a plethora of bumpy spots in the field, a typical occupational hazard. I go to take a sip of my drink and got a sip of half coffee/half lemonade Monster. I don't recommend the combination. Here's to you, bumpy Kansas wheat fields. DISCLAIMER: It will never be just "a few rounds." That's the trick phrase a harvester will use to get you to switch places for whatever reason. Before that story was given the opportunity to occur, we did incur some rainy days that were filled with wrenches and combine rehab. That's the thing about harvest -- time is of the essence. Dodge City, Kansas - Would you believe I have been a part of the AAWH family for six years now, and I have never even been to the homeland of High Plains Journal? Unreal, but that is no longer the case. I drove into town on Wyatt Earp Boulevard and took a quick look around and knew right away I would get along just fine around here. I could live here. We will be harvesting here for the indecipherable future as it decided to rain on our harvest parade last night (06/21), so I'm hoping to rub elbows with some of the HPJ staff. I also plan on doing quite the exposé on the town in an upcoming post as it is a definite harvest classic. We did get into the wheat a bit, and it's beautiful -- 50-60 bushels per acre with a 58 pound test weight. There's nothing like wheat harvest in Kansas. I wish I had an internal trip meter. I should have pushed this spring to keep track of the miles I put on myself. Scratch that -- should have started it last winter, because then it would include my international travels. The more I think about it, the further my curiosity for this goes. Just imagine 26 years of Midwestern travels via the harvest run plus all the trucker adventures, various road trips with friends and international travels. My trip meter would probably be broken by now. 22 Jun Janel: Blue header time – yea! Dodge City, Kansas - I love this time of year. I get to use my blue Shelbourne Reynolds header for wheat harvest at two of our stops here in Kansas. A stripper header is annoyingly expensive but is fun to run. I love blue header time. When I began harvesting with a Shelbourne Reynolds header 5-plus years ago, I was not happy about it. I just kept thinking about the added machinery expense and operation cost. The custom harvesting business has big risks and having another header to harvest wheat seemed so silly to me. Also, the government doesn’t have a program to insure our costs. There is no government program for the custom harvesting business. Also, learning to operate “another” piece of machinery just seemed ridiculous. However, my attitude changed very quickly, and it’s a super header to operate. My combine never runs out of horsepower having a blue header in front of it. There are many advantages with using a blue header, but I’ll discuss more at another time. It's a whole different concept. Pratt, Kansas - I love the Kansas wheat harvest and for so many reasons! Wheat harvest in Kansas feels like sweet summertime to me. I have so many harvesting memories in the Wheat State. Kansas is one of my favorite places to be and to harvest wheat. Honestly, the White House should be in western Kansas. Everyone here just loves President Donald Trump, or at least that’s all I hear. It’s so peaceful and beautiful out here. All of the people I know from Kansas are just genuinely friendly and really good people, and some are my favorites in the world. Yes, western Kansas is the place to be especially at wheat harvest time. Everywhere you look, it’s all golden. We’ve been harvesting full blast the past few days here in the Pratt, Kansas area, and it feels good. The wheat has been yielding well. 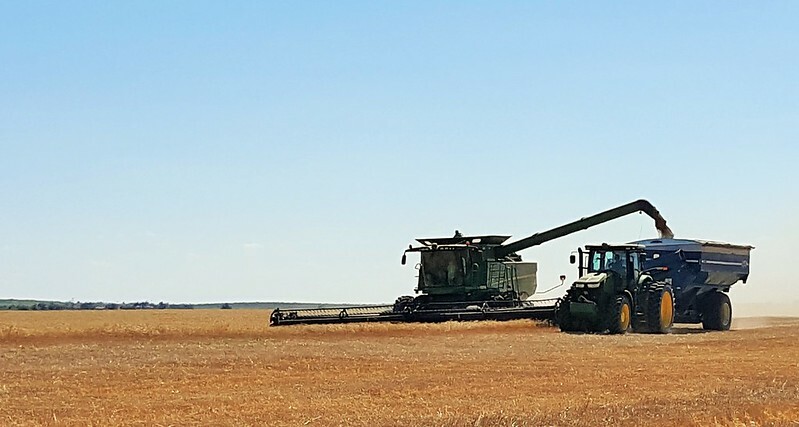 The ground conditions have been dry and the humidity during the day has been under 50 percent, which means the wheat is drying and the cutting conditions are on point. We have been on the edge of a couple of storms lately, but we haven’t had much rain. So luckily, we just keep cutting wheat. Ellis and Rush County, Kansas - A few days ago I gave you an update for half the crew. Today I'll give you the other half. This part of the crew had similar issues as the one further south. We fought several days of rain and/or humidity. The wheat never completely dried down and stayed in the 12-13 percent moisture range, so it was something to be watched the entire time they were cutting. This area had some hail and disease, and we had to abandon a couple fields because there just wasn't anything there. We saw yields anywhere from 0-55 bushels per acre. The elevator we hauled into was nice to work with and had great service. Let me explain. When I was out at the field, the first night they were really able to cut into the evening. I asked the question, "How late is the elevator staying open?" See, you don't harvest until the elevator closes. You take your trucks in to dump as late as they'll take you. Then you bring them back to the field and fill everything back up, so they're ready to unload first thing in the morning. And this allows you a bit more precious cutting time. Southern Kansas - The weather was relatively uncooperative when the crew was in west central Oklahoma. They were constantly catching little showers that kept them out of the field or fighting humidity. For several days, that left very slim information to share, so things have been slow in the reporting department. But all of a sudden, harvest cut loose again, so I'm going to rush to get caught up! The crew with Mark in Custer County, Oklahoma, saw yields ranging from the 30s to 50s. Test weights were average in the 58-60 pounds per bushel range. They finished in Oklahoma last Saturday night.